Burma's largest anti-government protest in nearly two decades has taken place in the former capital Rangoon, led by Buddhist monks and nuns. Unlike a day earlier, police barred a group of monks from entering the road that leads to the home of detained opposition leader Aung San Suu Kyi. The rallies began last month when the government doubled fuel prices. BBC South East Asia correspondent Jonathan Head says every day the protests are growing in size - the campaign the monks began just six days ago is now openly challenging the military, urging all citizens to join in. A huge column of demonstrators made its way through the heart of the city, following an identical route to that used during the failed anti-military uprising in 1988. There are no exact figures but the rally was estimated to be 20,000 strong. Our correspondent says the mood was relaxed, even euphoric, with thousands of civilians joining Buddhist monks and nuns, and chanting the key demands of this campaign - reconciliation with the opposition, the release of political prisoners and lower prices. Apparently unsure what to do, the security forces appear to be standing back for the moment and the next act in the drama is impossible to predict, says our correspondent. Speaking on the sidelines of a UN meeting, US Secretary of State Condoleezza Rice said America was "watching very carefully" the protests and denounced Burma's "brutal regime". "The Burmese people deserve better. They deserve the right to be able to live in freedom, just as everyone does." The head of regional grouping Asean, Ong Keng Yong said he hoped the Burmese authorities would not take any strong action "and turn the protests into a big confrontation". Ms Suu Kyi emerged tearfully on Saturday from the home where she has been under house arrest since 2003 to pray with the monks, after they were allowed through a roadblock. 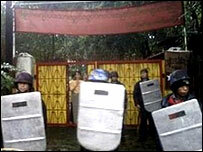 But on Sunday the barricades were firmly back in place and there was a heavy security presence near the democracy icon's home to prevent a repeat protest march past. Witnesses said the crowds formed a protective human chain, as the monks and nuns set off from Burma's most famous landmark, the revered Shwedagon Pagoda. Some demonstrators chanted "Release Suu Kyi" as they continued to the nearby Sule Pagoda, before passing the US embassy. Nobel Peace Prize Laureate Ms Suu Kyi has spent 11 of the last 18 years in detention. In 1990 her party won national elections, but these were annulled by the army and she was never allowed to take office. On Friday, the Alliance of All Burmese Buddhist Monks, which is leading the demonstrations, vowed to continue until they had "wiped the military dictatorship from the land". 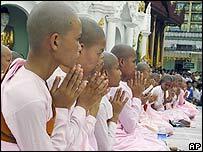 The monks have urged the Burmese people to hold prayer vigils in their doorways for 15 minutes at 2000 (1330 GMT) on Sunday, Monday and Tuesday. Scores of nuns joined more than 2,000 monks in prayer on Sunday at the Shwedagon Pagoda, before marching to the centre of Rangoon. I am not sure where these protests are going to, but I am sure that it's not at all a good sign. Many people are expecting that there will be a great change coming soon. I am not sure if the monks will be joined by students or workers or even soldiers. This situation is very vague because we don't know what the government is planning to do. There is some news in the government-controlled newspapers that fake monks are trying to agitate the public. This can be a big excuse for them when they start attacking the monks. I really want some changes in Burma but I am not sure where that may lead us. I hope there won't be any bloodbath this time like in 1988. We need a little reason to combine all opposition resources to lead a mass movement. This reason must be a political issue. The current situation can lead to a civil war because hardliners of junta still hold their role in constitution and the opposition may raise the tempo of movement under these conditions to form an armed struggle. We want a smooth change, not civil war. If there is no way to avoid the armed struggle, the people will choose it and it may take the poor country to a worse condition. International pressure is very important for the future of Burma - including from China and Russia. I'm not with the monks, but one of the monks who took part in the protests came to us and told us his experiences. We're very proud of them, because we are afraid to take risks. We admire our monks who care for us, and we wish and pray for them not to get harmed. Even though we are very concerned about them, he said, "We are not afraid, we have not committed any crime - we just said prayers and took part in the protests. We didn't accept any money from onlookers, although they offered us a lot. We only accept water.'." The monk seemed very happy, excited and proud. But I'm worried about them. Yes, I followed the monks. Very impressive and we are very motivated and encouraged to see them. We are ready to join them - and have done so. Today there were about 1,000 monks in our group, but I heard there are other groups as well. Wherever the monks pass by, people come out and support them and some follow on. It is amazing and I haven't experienced anything like that in my whole life.